Fluence has more than 30 years of experience in the design, construction, and operation of wastewater treatment plants, using proprietary technologies for a wide range of municipal, commercial, and industrial clients. Our decentralized, standard, and custom-designed wastewater treatment solutions are reliable and cost-effective. Fluence also has decades of experience in tertiary treatment, which allows for the reuse of treated wastewater in a diverse range of applications, from irrigation, to process water, to drinking water. Whether you need to treat municipal wastewater or industrial effluent, Fluence has a sustainable solution for your operation. 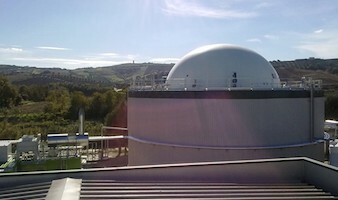 Our expertise extends to treating high-BOD effluent from food processing plants, to produced water from the oil and gas industry, to simple sewage treatment, and more. As well as conventional plants, we specialize in decentralized wastewater solutions that are modular, scalable, and quick to deploy. Contact our experts to discuss your specific project details, and learn how our wastewater solutions can help you meet your goals. At Fluence, our engineers have developed some of the most efficient and cost-effective wastewater treatment technologies on the market. Here are a few of our latest innovations in wastewater. Our best-in-class membrane aerated biofilm reactor (MABR) technology provides the most advanced class 1A-quality wastewater treatment in the industry, with power consumption up to 90% less than with traditional methods of aeration. Fluence’s MABR technology allows for simultaneous nitrification-denitrification and uses passive aeration, which is much more energy-efficient than the compressed-air aeration used in conventional treatment. Fluence has decades of experience in the delivery of cost-effective, reliable, state-of-the-art aeration and mixing solutions. Our line of aerators and mixers is one of the most comprehensive in the industry. Our SMARTAERATOR™ system is a highly innovative control system for new or existing aerators. It’s easy to implement, efficient, and cost-effective, reducing power consumption significantly. Contact us to learn more about our wastewater treatment solutions, or to discuss your next project with our experts. We’re here to help! When a residential development in Israel wanted a localized wastewater treatment solution to replace its existing pond system, it needed an odorless, quiet solution that would be energy-efficient, handle a high-nutrient stream, and use existing pond structures. The plant uses our revolutionary membrane aerated biofilm reactor (MABR) technology to treat 123,000 L/d, producing high-quality, reclaimed water suitable for agricultural reuse. 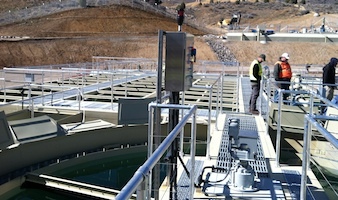 When replacing a wastewater treatment plant serving two communities in Nevada, uneven terrain made a conventional circular clarifier impossible. 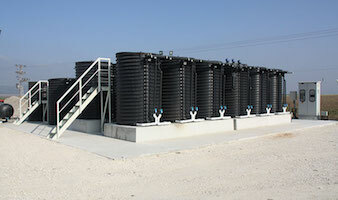 Modular tanks were custom-arranged to accommodate aeration and sludge-holding. Tanks were installed incrementally, which allowed the plant to handle a seasonal increase in wastewater flow due to an annual festival.